Salvatore Anthony Maglie (April 26, 1917 – December 28, 1992) was an American Major League Baseball pitcher and later, a scout and a pitching coach. He played from 1945 to 1958 for the New York Giants, Cleveland Indians, Brooklyn Dodgers, New York Yankees, and St. Louis Cardinals. Maglie was known as "Sal the Barber", because he gave close shaves—that is, pitched inside to hitters. Coincidentally, he also sported a five o'clock shadow look. He also had the distinction of being one of the few players, and only pitcher, to play for all three New York baseball teams then playing in the city (Maglie's playing career pre-dated the 1962 establishment of the fourth New York major league team, the expansion New York Mets, with whom he was never affiliated). During a 10-year major league baseball career, Maglie compiled 119 wins, 862 strikeouts, and an 3.15 earned run average. 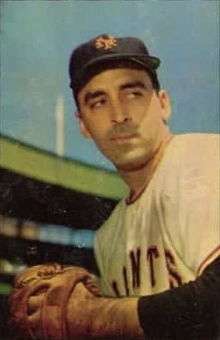 Maglie broke into the major leagues with the Giants in 1945, but jumped to the Mexican League prior to the 1946 season. For this, Maglie was banned from organized baseball by Commissioner Happy Chandler, and Maglie was unable to return to the Giants until 1950. The ban had been lifted in 1949, but Maglie chose to remain with the Drummondville Cubs, with whom he was playing at the time, and with whom he was making more money than he did with the Giants. After his return to the majors, Maglie was integral to the success of the New York Giant teams of the early 1950s. After a stint with Cleveland, Maglie was purchased by the Dodgers in May 1956. Maglie had a sterling comeback season for the Brooklyn Dodgers in 1956 (who won the NL pennant by one game over the Milwaukee Braves and two games over the Cincinnati Reds), going 13–5 with 2.89 ERA. On September 25 of that year, he no-hit the Philadelphia Phillies 5-0 at Ebbets Field. He finished second to Don Newcombe in the first balloting for the Cy Young Award, and was also second to Newcombe in MVP balloting. He was the Dodgers' pitcher opposing Don Larsen of the Yankees in the latter's famous perfect game in Game 5 of the 1956 World Series. Hall of Fame pitcher Don Drysdale credited Maglie with teaching him the art of brushing back batters while the two were teammates in Brooklyn. The man I love [Maglie] had quite an adventure tonight. Darrell Brandon pitching, and with Rod Carew on third base he's using a full wind-up. At the last moment he decides to take a look over at Carew, who's taking a pretty good lead. So he backs off the rubber and Sal yells at him, "For crissakes, get the hitter. The runner isn't going anyplace." So Darrell winds up and lets fly. And Carew steals home. When Darrell comes into the dugout at the end of the inning, Maglie lets him have it. "Dammit", he says. "You know you've got to pitch from the stretch in that situation." Jim Lonborg, AL Cy Young Award winner in 1967, credited his effectiveness that year to Maglie's lessons on pitching inside while he was a pitching coach for the Red Sox. During the 1950s, Maglie lived in Riverdale, The Bronx. Maglie died in 1992 due to complications from pneumonia. The book Carl Erskine's Tales from the Dodgers Dugout: Extra Innings (2004) includes short stories from former Dodger pitcher Carl Erskine. Maglie is prominent in many of these stories. Sal Maglie Stadium, located in Hyde Park in his hometown of Niagara Falls, New York, was named after him in June 1983. The ceremony featured the world's shortest baseball bus excursion. A bus loaded with friends and family of Maglie left the Stadium Grill located about two hundred yards across the street and drove into Sal Maglie Stadium The event was captured in a story done by Bob Koshinski and aired on ESPN. Sal Maglie Stadium is now the home to the Niagara Purple Eagles college baseball team, Niagara Falls Wolverines (high school baseball), Niagara Catholic Patriots (high school baseball), and Niagara Power of the NYCBL. ↑ Dickson, Paul (1989). The Dickson Baseball Dictionary. United States: Facts on File. p. 29. ISBN 0816017417. ↑ Collins, Glenn. " BASEBALL: SUBWAY SERIES; 1956 vs. 2000? It's Deja Vu All Over Again, Except for When It's Not", The New York Times, October 21, 2000. Accessed May 3, 2008. "In 1956, the Dodger legend Pee Wee Reese occupied a modest brick duplex on Barwell Terrace in Bay Ridge, pitcher Sal Maglie lived in Riverdale and many Yankees occupied an apartment hotel on the Grand Concourse in the Bronx."